The Patient-Specific Functional Scale (PSFS) is a self-reported, patient-specific outcome measure, designed to assess functional change, primarily in patients presenting with musculoskeletal disorders The scale was developed by Stratford et al 1995 as a self-report measure of function that could be used in patients with varying levels of independence. It was designed to provide clinicians with a valid, reliable, responsive, and efficient outcome measure that would be easy to use and applicable to a large number of clinical presentations. It has been shown to be responsive to clinically relevant change over time; even in chronic pain patients. As a clinical outcome measure, the PSFS allows patients to report on their functional status at baseline and at a follow-up session, to determine if a meaningful change in functional status has occurred. Patients are asked to identify up to five important activities they are unable to perform or are having difficulty with as a result of their problem i.e. putting socks on. 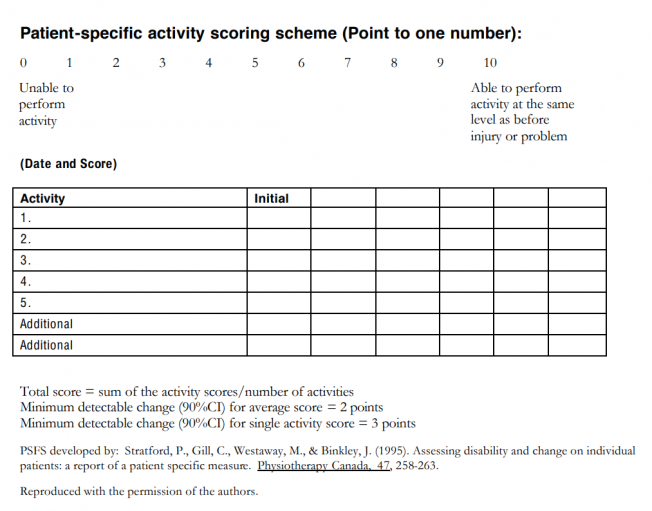 In addition to identifying the activities, patients are asked to rate, on an 11-point scale, the current level of difficulty associated with each activity. Following the intervention, patients are asked again to rate the activities previously identified and are given the chance to nominate new problematic activities that might have arisen during that time. Patients select a value that best describes their current level of ability on each activity assessed. Not obtaining a final PSFS score. For example if a patient cancels their final appointment it is not always possible to ask for the score completion. The PSFS is a valid, reliable, and responsive outcome measure for patients with back, neck, knee and upper extremity problems. It has also been shown to have a high test-retest reliability in both generic lower back pain and knee dysfunction issues. A study into cervical radiculopathy found the test-retest reliability of the PSFS to be high (Intraclass correlation coefficient = 0.82; 95% Confidence interval= 0.54–0.93) in comparison with the Neck Disability Index. ↑ 1.0 1.1 Horn KK, Jennings S, Richardson G, Van Vliet D, Hefford C, Abbott JH. The patient-specific functional scale: psychometrics, clinimetrics, and application as a clinical outcome measure. journal of orthopaedic & sports physical therapy. 2012 Jan;42(1):30-D17. ↑ Abbott JH, Schmitt J. Minimum important differences for the patient-specific functional scale, 4 region-specific outcome measures, and the numeric pain rating scale. Journal of Orthopaedic & Sports Physical Therapy. 2014 Aug;44(8):560-4. ↑ Stratford P, Gill C, Westaway M, Binkley J. Assessing disability and change on individual patients: a report of a patient specific measure. Physiotherapy canada. 1995 Oct;47(4):258-63. ↑ 4.0 4.1 Maughan EF, Lewis JS. Outcome measures in chronic low back pain. European Spine Journal. 2010 Sep 1;19(9):1484-94. ↑ 5.0 5.1 Hefford C, Abbott JH, Arnold R, Baxter GD. The patient-specific functional scale: validity, reliability, and responsiveness in patients with upper extremity musculoskeletal problems. journal of orthopaedic & sports physical therapy. 2012 Feb;42(2):56-65. ↑ 6.0 6.1 Nicholas P, Hefford C, Tumilty S. The use of the Patient-Specific Functional Scale to measure rehabilitative progress in a physiotherapy setting. Journal of Manual & Manipulative Therapy. 2012 Aug 1;20(3):147-52. ↑ 7.0 7.1 Westaway MD, Stratford PW, Binkley JM. The patient-specific functional scale: validation of its use in persons with neck dysfunction. Journal of Orthopaedic & Sports Physical Therapy. 1998 May;27(5):331-8. ↑ Chatman AB, Hyams SP, Neel JM, Binkley JM, Stratford PW, Schomberg A, Stabler M. The Patient-Specific Functional Scale: measurement properties in patients with knee dysfunction. Physical therapy. 1997 Aug 1;77(8):820-9. ↑ Cleland JA, Fritz JM, Whitman JM, Palmer JA. The reliability and construct validity of the Neck Disability Index and patient specific functional scale in patients with cervical radiculopathy. Spine. 2006 Mar 1;31(5):598-602.